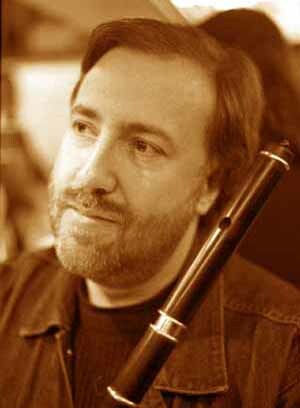 Flute player Michel Sikiotakis is well known in Irish music circles as a multi-talented musician, bandleader and workshop instructor. He plays in a style learned directly from great traditional Irish musicians. Michel began visiting Ireland regularly in 1980. He was a founding member of Paris-based Irish band Shamrock with whom he received the famed All Ireland Champion title in 1984, and his tin whistle playing earned him another All Ireland Champion title the following year. Shamrock recorded an album for Polydor Ireland called Mo Cheol Thú. Michel's collaboration with Breton harp player Anne-Marie Jan resulted in the release of a duo cassette in 1988, and in the same year he founded the Irish band Taxi Mauve with fiddler Jean-Claude Philippe. Taxi Mauve has toured extensively throughout France, and released the album Far Off Fields for Breton record company Keltia Musique. Taxi Mauve was the only France based band to be chosen for the Franco-Irish partnership L'Imaginaire Irlandais. The band is still active, with a new line-up including singer Ann Boyce from Co. Donegal. In 1996, on commission from state-owned cultural complex "La Villette," Michel founded the world music band Mugar with co-bandleaders Youenn Le Berre and Nasredine Dalil. Mugar is a ten-piece extravaganza performing original music based on Berber (North African) and Celtic Isles traditions. Mugar has recorded the album Kabily-touseg for Tempo Maker/Melodie, licensed in North America to Canadian record company Mosaique. Michel has been teaching Irish music in Paris since 1982, and now conducts workshops in both France and Ireland, including the Fleadh Nua Festival in Ennis. In 1995, the Silex record company commissioned him to produce a CD of field recordings in Ireland. This CD was very well received by the French and international press alike. Born in Paris in 1961 of a French mother and a second-generation Greek father, Michel has been playing music since childhood. His first instrument was a Moroccan wooden whistle, which was followed by tin whistle, guitar, Breton bombarde, banjo, low whistle, and of course the 19th century eight-keyed wooden concert flute, known in the West of Ireland as... "the flute." His new venture is to play the uilleann pipes, so watch out!